Credits: This Blog is published on the Stitch & Bear food blog (Link: Click here for more detail.) review by blogger Joanne Cronin. It’s a bitterly cold January lunchtime as we enter Blackrock Market. Wind is funnelled by the crowded aisles and as we pass the shuttered doors of Michelin-starred Heron & Grey, I find myself wishing for somewhere warm and cosy. Going for lunch after my yoga class, while still in my yoga leggings, doesn’t seem like a good idea anymore. We are here in search of 3 Leaves, a small Indian restaurant from chef Santosh Thomas and his wife Milie who came to Ireland over 10 years ago. 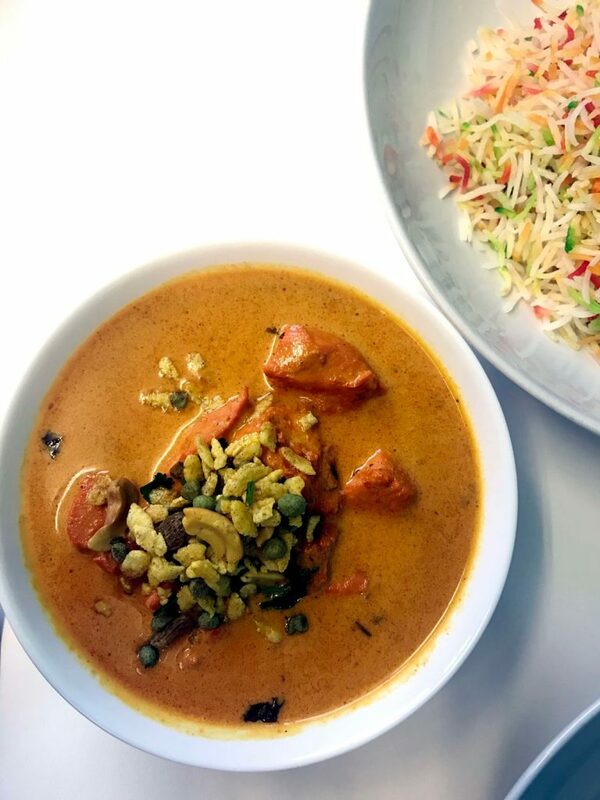 The buzz about this little spot has been quietly growing, and last year Thomas scooped the Best Indian Chef in Dublin gong at the Irish Curry Awards. Not bad for a small little spot in a market! The exterior of 3 Leaves is painted the most calming shade of mint green that I’ve ever seen. It simply brightens the soul to see it. A single large table sits in the room that is home to the kitchen and hot food counter, while a second room a few doors up hosts several other simple bare bones tables and chairs. This is not fine dining, more like pine dining. The menu features a rotating spread of dishes, with starters changing daily and mains changing on a weekly basis. 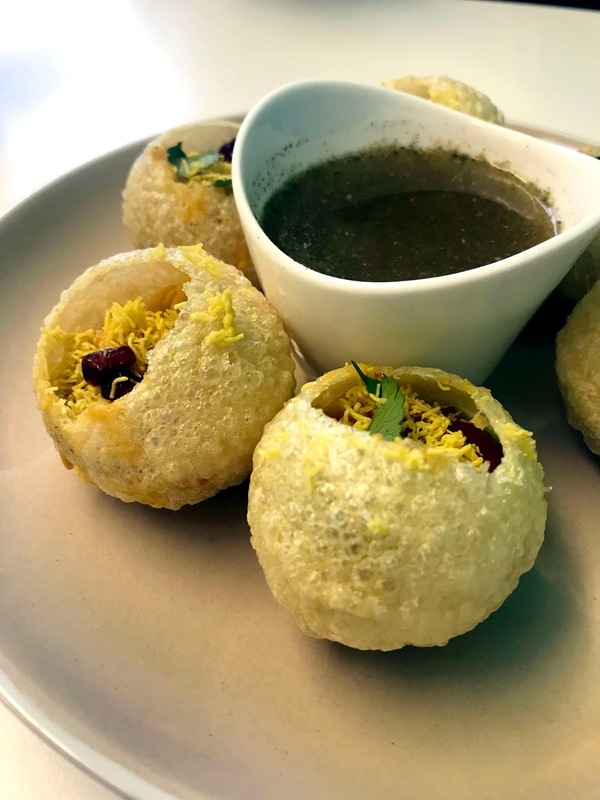 I adore Indian street food snacks, so we kick off with one of my favourites, pani puri (€6.00). These are little crisp fried shells filled with a mixture of masala, chaat, onion & sweet tamarind to which you add some imli pani water before popping the whole lot into your gob. Delicious. The door opens again, letting in a wash of freezing air, accompanied by a smiling Santoash and plates of more street food and curries. He has a quick chat with another market worker who is taking a break with a curry, before dropping off our palak pakora chaat. 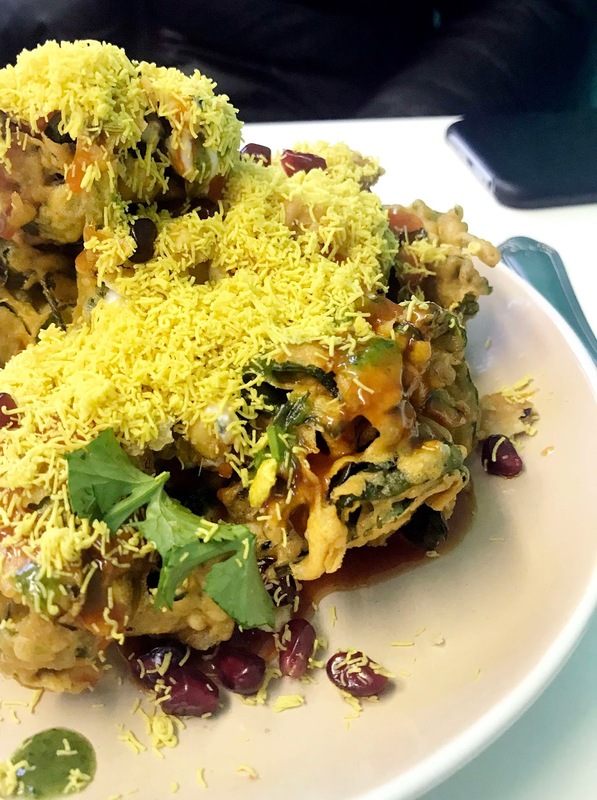 These crunchy fried spinach fritters are topped with a vibrant splash of pomegranate seeds, a literal deluge of sev (crunchy pieces of chickpea noodle) and even more tamarind (€6.00). Finally, we demolish a portion of papadi chaat, or little crisp discs topped with a mixture of potatoes, chickpeas, yogurt and tamarind. It’s a mix of contradictions, cool and creamy, yet sweet and spicy. I had struggled to choose a curry from the selection on offer that day, but Milie kindly took charge by offering a little taster of each curry, while proudly explaining the key aspects of each. I take the three little dishes back to our table and we try each in turn. Eventually we opt for the the Gulabi Chicken curry (€9.50), a richly orange dish flavoured with the secret addition of rose petals, but the Beef Yakani Masala (€9.50) with its rich, fragrant spicing was very tempting on that cold day. As we leave, a pair of elderly ladies are settling in to enjoy their lunch, each pulling a bottle of wine from her handbag. It turns out that 3 Leaves is also a BYOB restaurant, which is yet another reason to love the place. We settle our ridiculously good value bill with the ever smiling Milie and promise to return.